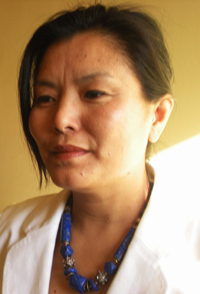 I am Tamdin Sither Bradley, a Tibetan doctor who practises Tibetan medicine in London, England. I qualified from the Tibetan Medical Institute in Dharamsala, India in 1987. Since 1995 I have been a full time practitioner of Tibetan medicine in England, building up my practice over the last 15 years by word of mouth. At present I see clients in St. Johns Wood, London at the Kailash Centre for Oriental Medicine; at my home in Woodford, Essex; in Corsham, Wiltshire; in Brussels, Belgium; and in Stockholm, Sweden. Full details of the above places are to be found on the contacts page. I am one of the founding members of the British Association for Traditional Tibetan Medicine, a registered association representing Tibetan medicine in the United Kingdom. I am fully insured by Towergate Professional Risks. In 1998 I co-authored the book The Buddha’s Art of Healing, published by Rizzoli Editions, and in 2000 I wrote Principles of Tibetan Medicine published by Thorsons, Harper Collins which has been translated into Japanese and is presently being translated into German. I have recently produced a range of natural products which blend the ancient wisdom of Tibetan medicine with modern science. 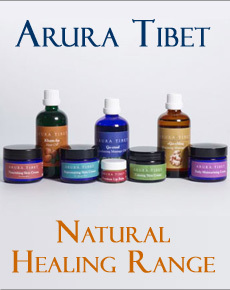 The Arura Tibet Natural Healing Range of skin creams, massage oils, and balms are available to order on this site. All these products are based on pure and natural ingredients – herbs, waxes, vegetable oils and essential oils. They are sourced both ethically and ecologically.